We have a German Shepherd named Dargo. He is our pride and joy…and such a sweet, kind soul. He is truly loyal to us, and is like a baby around our house. I really had no idea how sweet GSD’s could be before getting Dargo and now I couldn’t imagine any other type of dog. 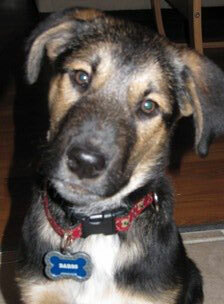 He doesn’t have the typical high ears, but the floppy ears that Dargo has really plays into his character. He’s smart and patient and tolerant and a great friend. We hope you love Dargo as much as we do.